The book charts: his early life before the outbreak of war in 1939; the decisions he made; and, those that were made for him. He describes how an ordinary working class boy from Maidstone was propelled into the most extraordinary of situations, landing him in the thick of the action in the skies over Kent during the summer and autumn of 1940. 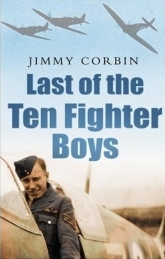 Jimmy Corbin DFC was a schoolteacher before training as a pilot. Joining a frontline Spitfire squadron in the summer of 1940. He flew operationally in the Battle of Britain, later instructing at an Operational Training Unit before being posted to North Africa as a Spitfire pilot. After the war he resumed his career as a schoolteacher. Now retired, he lives in Kent. Only 10 of these Special Editions were produced.